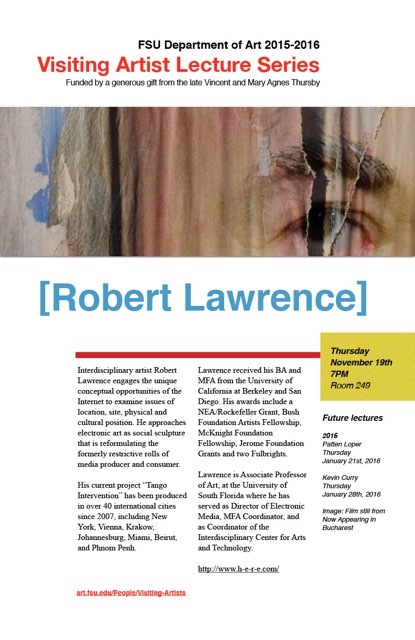 Interdisciplinary artist Robert Lawrence engages the unique conceptual opportunities of the Internet to examine issues of location, site, physical and cultural position. He approaches electronic art as social sculpture that is reformulating the formerly restrictive rolls of media producer and consumer. His current project “Tango Intervention” has been produced in over 40 international cities since 2007, including New York, Vienna, Krakow, Johannesburg, Miami, Beirut, and Phnom Penh. Lawrence received his BA and MFA from the University of California at Berkeley and San Diego. His awards include a NEA/Rockefeller Grant, Bush Foundation Artists Fellowship, McKnight Foundation Fellowship, Jerome Foundation Grants and two Fulbrights. 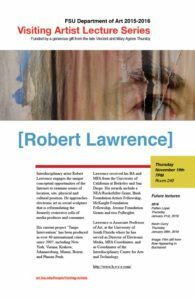 Lawrence is Associate Professor of Art, at the University of South Florida where he has served as Director of Electronic Media, MFA Coordinator, and as Coordinator of the Interdisciplinary Center for Arts and Technology.